Star Wars: The Clone Wars is simply an extended commercial for an animated TV series debuting in the fall and a whole new slew of toys already lining store shelves. The story is trivial. Jabba the Hutt’s son has been kidnapped and it’s up to Anakin Skywalker and Obi-Wan Kenobi to rescue the slugster. Yes. They’re his only hope. Padding the movie’s 98-or-so minutes are lots and lots of fight scenes. There are battles with giant walking tanks; blaster battles between clone troopers and battle droids; and lightsaber duels between good and e-vil. On the bright side, the animation style, supplied by Lucas Animation, offers an eyeful, including some incredibly detailed costumes. This slick, computer-generated approach is far better than the borderline Hanna-Barbera stylings of the Clone Wars shorts that aired on the Cartoon Network a few years ago, but it’s not quite on par with Pixar’s efforts. At least Christopher Lee (Count Dooku), Samuel L. Jackson (Mace Windu), and Anthony Daniels (C-3PO) lend vocal talent to the roles they played in the live-action movies. Actually, there are several differences between this cinematic spin-off and the original movies. For starters, apparently lacking confidence in the project, 20th Century Fox passed on its distribution. Now the Warner Bros. logo graces the opening instead of the all-too familiar Fox fanfare. But the first real disappointment is that the famous scroll was scrapped. Instead, the Star Wars: The Clone Wars logo blasts into the distance followed a bit of narration that attempts to very quickly set the stage. Jeez, George, at least you could’ve pinned a bit of educational value on this extraneous, irrelevant bit of fluff by offering the kids something to read up front. But the biggest problem here is a total lack of Star Wars magic. Part of the fun and appeal of the Star Wars movies was the human element – that goes double for the original original trilogy, which featured old-fangled, man-made model spaceships. 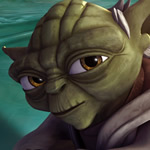 Those movies offered up a sense of wonder, both in terms of story and technique, as when Yoda (at the time, daringly brought to life by Muppeteer Frank Oz) explained the Force to Luke in that yucky, mucky land of Dagobah. In The Clone Wars, no effort is made to further develop the characters or conjure up any sense of magic. It’s hard to be impressed by all the action high-jinks when it’s fully animated and completely built out of bits and bytes. From a certain point of view, it’s simply George Lucas taking one more step to extract himself – and his Star Wars empire – from humanity. Even with the paper-thin storyline and ear-wincing dialogue, the biggest problem with The Clone Wars is its own disregard for the Star Wars universe. Who knew Jabba had a son? Did anybody particularly care? And, since everything in Star Wars always seems to tie back to that barren sand heap called Tatooine, how is it that the name “Skywalker” meant nothing to Jabba in Episode VI? But more significantly, how is it that this sub-adventure, which figures somewhere between Episodes II and III, shows Anakin being responsible for his own padawan learner, a girl named Ahsoka Tano? Hmmm… In the live-action movies, it never seemed like there was enough faith in Anakin for him to be put in charge of another padawan. He was too out of control and rambunctious. He never even completed his own training, for Pete’s sake! Lost the point you have, George. The fairly ingenious, overarching plotline of the Star Wars movies helped redefine the possibilities sequels could offer by mapping out a beginning, middle, and end. Well, at least this endeavor offers one really nice surprise: a great score by Kevin Kiner (CSI: Miami). Using John Williams’ music as a launching pad, Kiner takes this animated adventure into fresh musical terrain. The highlights include a jazzy number by those legendary cantina band guys and an exotic bit surrounding an abandoned monastery that plays like some kind of mix between Middle Eastern ululations and Enigma.